Rotochopper diesel grinders deliver colored landscape mulch, animal bedding, compost and other products with precision grinding and unmatched versatility. 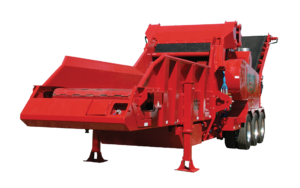 Our diesel horizontal grinders deliver “Perfect In One Pass” simplicity for diverse feedstocks, including wood waste, agricultural residue, and organic waste. Rotochopper diesel grinders are the only portable grinding systems that let operators quickly switch raw materials while maintaining strict product specifications. Select a machine to find the right diesel grinding solution for your raw materials. Rugged and reliable, Rotochopper diesel horizontal grinders have set industry standards for more than 25 years. Our diesel powered grinders, from 275–1050 HP, transform your wood waste into profitable end products. From logs & whole trees to pallet scrap and sorted C & D, Rotochopper has a solution for your grinding business, including technology for highly-abrasive materials like asphalt shingles or yard waste. These innovations allow you to diversify your grinding operation with simplicity and efficiency, maximizing the value of your grinding equipment. Packed with exclusive maintenance simplifying features, Rotochopper grinders keep you in control of your end product specifications and your production schedules. Changing teeth and screens is fast and easy. Routine maintenance areas are designed for quick access. Spend less time on maintenance and more time turning raw materials into commodities. Rotochopper equipment has allowed us to expand into other markets. We started with grinding pallet waste into colored landscape mulch, now we are doing animal bedding and pellet fuel.